Y’all know how much I love podcasts, but for my latest drive to visit the boy I tried something a little different: audiobooks. I used a free trial of the Amazon related platform Audible and it worked really well. The drive was approximately ~6hrs, so I got two books that together would provide more than enough entertainment and were two very different genres. Audible is a subscription based program. The first 30 days are free, then after that it is about $15 a month where you get 1 credit a month, which usually equals one book. If you want to buy an additional book that month then members get 30% off. So, just like Blue Apron, after I used the free trial I immediately cancelled my subscription because I don’t got money like that. Although, I would consider just paying for another book on its own next time I have a long drive to make. Overall, I really enjoyed the platform I just can’t afford it monthly. 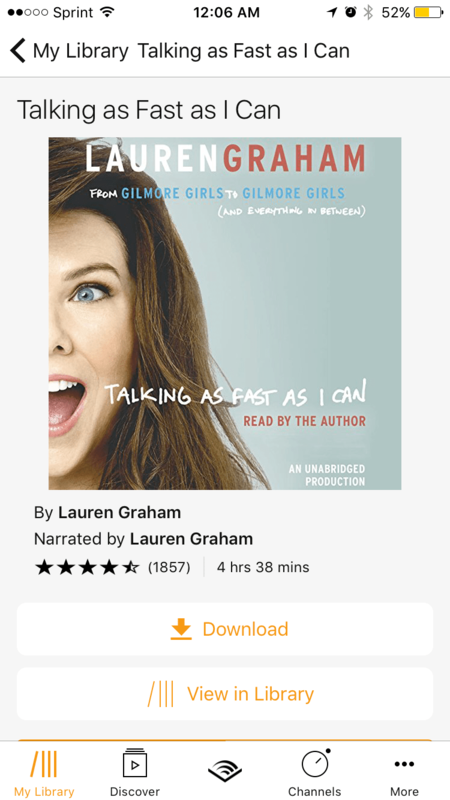 Narrator Voice: The narration was down by Lauren Graham herself which I really enjoyed. She was easy to listen to and since it was a biography of sorts it added to the overall story. Story/Content: I love Lauren Graham mostly for her characters on Gilmore Girls and Parenthood. This book of hers gave a look at how she got into the industry, the jobs she had before she “made it,” insider tips about life in Hollywood, her love life, and of course the back stage look at the Gilmore Girls Revival! Overall Enjoyment: I loved it! The book was very light hearted and Lauren Graham seems to have such a down to earth personality for a celebrity like herself. The book is witty and filled with humor that reminded me of her Gilmore Girls character, Lorelai. 9/10 recommend! Narrator Voice: This is a fiction book, therefore each character has a different narrator, or at least they all sound slightly different. The book is set in London, so they do all have a British accent. I honestly had a hard time distinguishing some of the characters, but they may also be because the book switches point of view after each chapter. Story/Content: The book is about a woman who rides the train into the city every day and looks out onto the neighborhood where she used to live with her ex-husband. She watches a neighboring couple on her old street which she creates names and personalities for. The book continues about her life and her struggle in dealing with her husbands affair which led to her divorce, and all culminates around a mysterious murder of woman on that street, the same woman she created fantasies about each time she passed their house on the train. 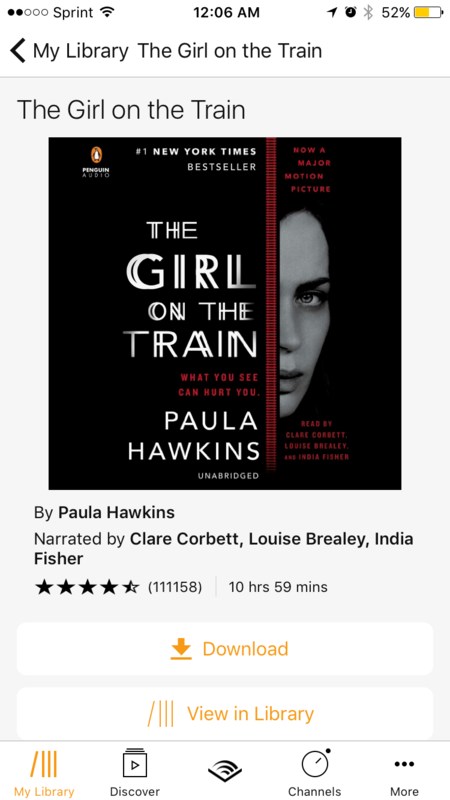 Overall Enjoyment: Everyone that has recommended Audible to me, said I should definitely try this book, but I was not really impressed. The story drags at times, I didn’t think any of the plot twists were that surprising or innovative, so overall it was just okay. I think part of it had to do with the monotony and/or the annoyance of their voices. 6.5/10 recommend! Have a book recommendation for me? Comment below!